The 20th Century decorative arts market gets very busy at this time of year with most of the major auctions houses scheduling their sales this week and next. Christie’s New York held their sale yesterday with some very interesting results. Today I’ll review the French cameo glass. The runaway record price of the French cameo portion of the sale was for a large Gallé vase decorated with parrots. The subject matter was rare and the vase was big (21¼”), but the workmanship was standard acid-etching and the colors were chartreuse and brown — tough colors to sell. It was estimated to sell for $30-50,000, which in my opinion was too high. I was bidding on the telephone and told the Christie’s representative that I thought the vase would not reach reserve and would fail to sell. Wrong!!! The old adage that it only takes two to make an auction was certainly true today. Two determined bidders fought for this vase all the way to $104,500, including buyer’s premium — an astonishing price. If I had owned it, I would have marked it $25,000 and would have had trouble selling it, but what do I know? I’ve only been selling French cameo glass for 35 years. A beautiful small Daum bottle with an applied dragonfly and wheel-carved stopper sold for $12,500, including buyer’s premium, against a pre-sale estimate of $10-15,000. Another Daum vase, with wheel-carved stylized flowers, sold slightly below estimate at $7,000 + buyer’s premium ($8,750), while carrying a pre-sale estimate of $8-12,000. A Daum lamp with grape decoration and applied snails was estimated too aggressively at $60-80,000 and as a result failed to sell. 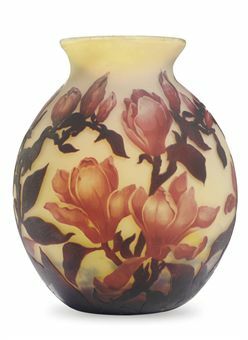 A huge Muller vase, 14½” tall and bulbous, with magnolia flower decoration, exceeded the high estimate, selling for $13,750. It carried a fair pre-sale estimate of $6-9,000. Tomorrow I’ll review the Tiffany lamps sold at the Christie’s sale. There were some fireworks, so you won’t want to miss this report. 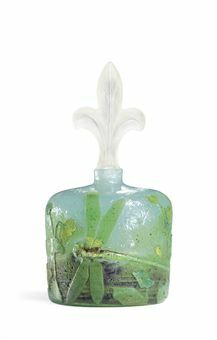 This entry was posted in Auctions, Daum Nancy, French cameo glass, Galle and tagged Authentic Galle, Daum, Daum Nancy, French cameo glass, Philip Chasen by Philip Chasen. Bookmark the permalink. I own a beautiful “signed” Galle vase … 13 1/2″ high in beautiful condition. Have been told it is an early piece. Am wondering if you could tell me what it might bring at auction. Do have a digital photo of this piece that I can forward to you, if you wish. Will await a communication from your representative. (By the way, this piece was a wedding gift to me mother and father-in-law in 1920).